Chaotic Moon Labs' Kinect-controlled skateboard was pretty awesome, but the company has managed to blow our minds with its Board of Imagination. Crave talks with one of the creators to find out how it works. Whurley from Chaotic Moon Labs takes a ride on the Board of Imagination. 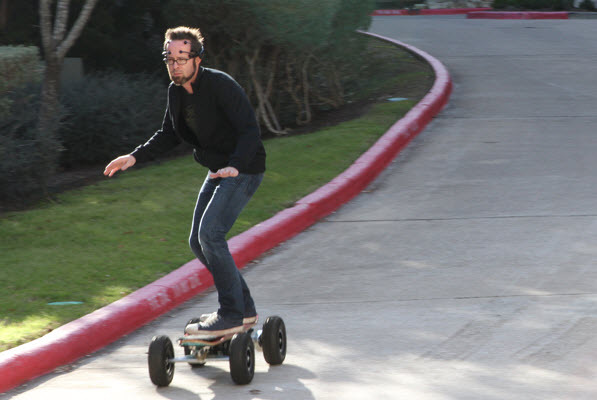 Remember the Board of Awesomeness, the Kinect-controlled motorized skateboard from CES? Well, it just got more awesome. The creator of this high-tech board, Chaotic Moon Labs, has come up with a new version called the Board of Imagination that works by reading your brain waves. That's right, a mind-controlled skateboard. You simply imagine where you'd like to go and how fast you want to get there, and the Board of Imagination will take care of the rest. It's powered by the same 800-watt electric motor and Windows 8-enabled Samsung tablet as the Board of Awesomeness, but it adds an emotive headset to read your thoughts to set the board in motion. 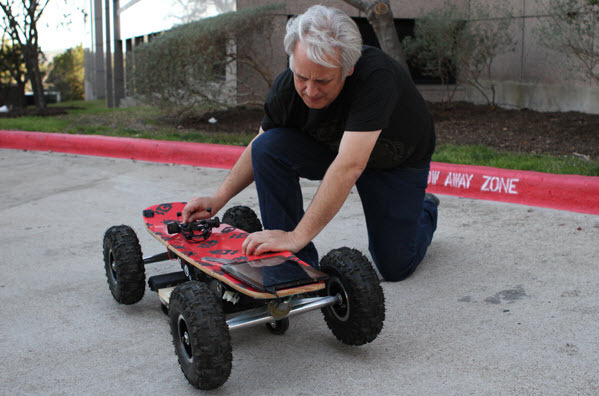 To wrap our heads around how it all works, Crave talked with Whurley (like Prince and Cher, it's just Whurley), general manager of Chaotic Moon Labs, to learn more about the technology behind the Board of Imagination. We also plan to go for a ride on the board soon (I'm going out to buy my crash helmet now), so definitely stay tuned for more. Q: Can you explain how the emotive headset reads and translates your brainwaves? What's the technology behind it? Whurley: Simply put, the headset is trained to the rider (in this case me) so that after some practice with just a computer (i.e, no danger) a profile of the way the rider "thinks" is made. That profile can then be loaded on the board. Since every brain is different, you can't really have one profile to rule them all. The Emotiv EPOC headset is a high-resolution, neuro-signal acquisition and processing wireless neuro-headset. This revolutionary new personal interface for human computer interaction has a good price point and is easy to get your hands on, which made it perfect for the Board of Imagination project. How does the headset communicate with the engine? Whurley: The headset sends the signals from the rider's brain to a Samsung Windows 8 tablet via a proprietary USB connector that comes with the headset. From there, software on the board interfaces with the electric motor via a "phidget," which is basically a plug-and-play, low-cost USB sensing and control unit. In the video, you talk about imagining where you want to go. So, do you then think about a point ahead of you (for example, a stop sign at the end of the street) to move forward? Or do you simply think, "I want to move forward"? Whurley: The controls are even more simple than our original Board of Awesomeness. To move, you simply imagine or visualize yourself somewhere (i.e., you pick a point out in the distance) and then imagine how fast you want to close the gap between you and that point. Think about imagining "pulling" yourself to that point. When you do, the signal from your brain is translated via the on board Samsung tablet and the board takes you there. Does the emotive system understand only simple commands like forward and stop? Or can you imagine more detailed instructions like "slow down"? Whurley: We have added slowing down and speeding up and braking to the control set. The slowing down and speeding up is basically handled by a range from dead stop to full throttle [the board can go up to 32mph]. We created this and it works, but we've already modified the software to improve it now that we have a few hours of riding under our belts. How does it work on longer rides? Whurley: It's amazing. However, without charging, the range is about 10 miles if you travel at the highest speed. So that's about the maximum length of a long ride. What happens if you get distracted or start thinking about other things, like errands you have to run? Whurley: When we first tested in downtown Austin [Texas, where the company is based], we quickly realized that we would have to find a way to handle distraction. While we did the best we can to compensate, it will always be an issue for most riders. What part does the Samsung tablet and Windows 8 preview play? Whurley: The Samsung tablet is a favorite of ours and was the brains of the original Board of Awesomeness. It's lightweight, powerful, and most importantly rugged. It's essentially the brains of the operation and provides the processing power we need for the calculation/recalculation that makes all of the magic possible. Philip Wheat from Chaotic Moon Labs checks the gear, which includes a Samsung tablet running a preview of Windows 8, and an Emotiv EPOC headset. What made you go with this system instead of the Kinect system you had before? Whurley: The Kinect on the original Board of Awesomeness was awesome, and one of the goals of that project was to prove that you can use a Kinect outside in a nonstationary environment. That said, this wasn't really a replacement, and the Kinect project was tremendously successful. What we set out to do here was to try and eliminate a few key issues (mainly related to environmental variables) and create as direct a connection as possible between the rider and the board. Mind control originally came up as somewhat of a joke in our first brainstorming meeting, but hey, what do you know? It ended up being the best idea in the end. How long did the Board of Imagination take, from concept to actual product? Whurley: Literally less than 48 hours, but add to that at least another 48 hours of creating a profile of the rider's brain and practicing starts and stops with the board suspended off the ground. When will we see the Board of Imagination hit the streets? While there are currently no plans to bring this to market, we are planning to open source the code, bill of materials, and cost of goods so that people can build their own Board of Awesomeness or Board of Imagination--provided we get the clearance from our attorneys first. Liked this? Then Please share this page on Twitter (by clicking on the “Tweet” button) and subscribe to get the top stories of the week, plus the most popular reviews delivered straight to your inbox. And don’t forget to give us your suggestions in the comments! Created by: Ardalan R. , 2011. Picture Window theme. Powered by Blogger.